This is truly "The Mouse That Roared!" With a big 454 cubic inch displacement, Motown cylinder heads with high volume/flow 220 cfm intake ports and a new Motown intake manifold that out-performs all others on the market, it's one potent package. Up to 600 dyno-tested horsepower, and still backed by a 2-year, 24,000 mile limited warranty. 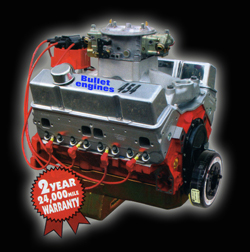 Reliability is another one of the important attributes of the hot "Limited Edition" engines from BULLET ENGINES.